I am an IT Professional currently working in Singapore with HCL since last three years. 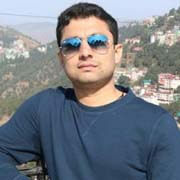 My Native is Himachal Pradesh and my family resides in Ahmedabad, Gujarat. By nature i am PACE. Appear cool, calm and controlled under pressure. Appear stable, emotionally adjusted, in harmony with the world. Do not like to be rushed at the last minute ... plan ahead Noted for good memory and being a good listener Organizer of time to get work done on schedule. I love sports , driving and watching movies. !!!#!!! Singapore Matrimony most trusted free matrimonial site, we are committed to helping people to find their potential life partners. We always strive to make your Singapore community matchmaking a pleasant experience. Singapore matrimonial is absolutely safe, simple and easy to register. Singapore Matrimony a part of Plusmatrimony.com is a pioneer in online matrimonial websites. We are Indian most trusted and respected Singapore matrimony sites offering large number of verified matrimony profiles of Singapore bride and grooms globally.